The Horne Section bring together stand-up and live music in a free-wheeling and spontaneous combination. The group is led by Alex Horne, the creator and host of hit Dave TV Series Taskmaster. 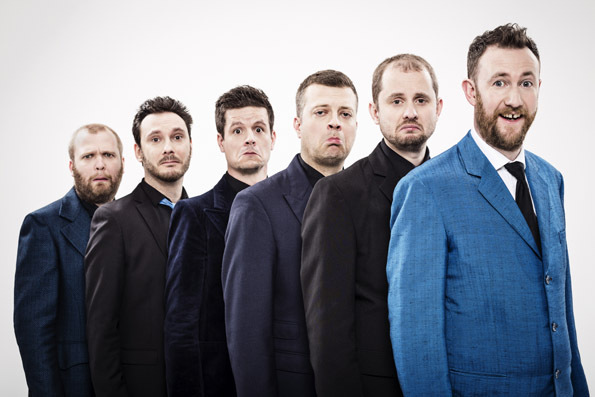 Their live show Horne Section’s Questions Sessions pits some of the finest contemporary comedians against each other to complete the most unlikely tasks, and has enjoyed sell-out runs in Edinburgh and at the Soho Theatre. The Horne Section have recently starred in Horne Section’s Christmas, a “deliciously blasphemous delight” (Chortle) of a short film that aired on Sky Arts on Christmas Day. They are the only band that has ever hosted 8 out of 10 Cats Does Countdown and Never Mind the Buzcocks. They have also appeared on The John Bishop Show, as well as presenting three series of their very own show for BBC Radio 4. ‘A joyful, high-octane collision of stand-up, musical improvisation and variety…one of the most original and entertaining comedy cabarets you’ll see’ (Guardian).